The Parklands of Floyds Fork is an amazing collection of parks, trails, streams, and amenities covering 4,000 acres in Jefferson County. My dog, Chip, and I have enjoyed exploring two of the gems, Broad Run Park and Turkey Run Park. 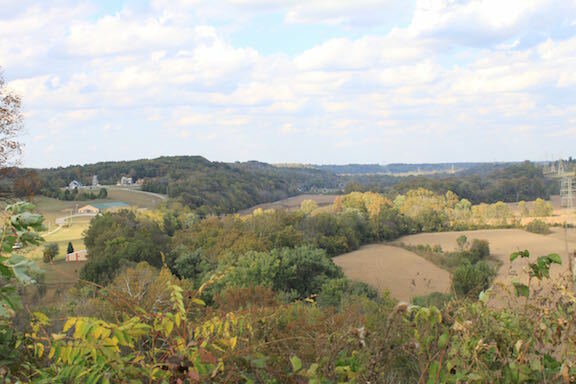 The photo above was taken from the overlook at Broad Run. Part of the trail around the Squire Boone Bottoms at Turkey Run Park. Possibly wild asters, I’m not so good with identifying flora. The Parklands are filled with wildflowers. Floyds Fork Creek is a tributary of the Salt River. Even the debris is photogenic at the Parklands. My best buddy taking a much-deserved rest after a hike at Turkey Run.